We offer safe, expert fumigation services designed to provide comprehensive drywood termite control. Fumigation allows us to treat every piece of wood in your home or business, even those pieces that may be covered with drywall or plaster or be located in distant corners of your attic, eaves, or basement, using a fumigant that is toxic to termites. Our fumigation services are guaranteed to kill termites. We only use Vikane® gas for our fumigations. Because it is an inorganic gas, Vikane® gas fumigant completely dissipates from a structure following fumigation, leaving no surface residue, odor, or film behind. This means you will not have to wash dishes, linens, clothing, or furnishings after fumigation. 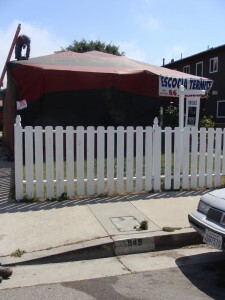 The first step in a fumigation is tenting. Our crew will use a canvas tent to thoroughly seal off your entire home or business from the roof to the foundation. Then one of our licensed fumigators will check that all people, pets, plants, and foods have been removed from the property. Then the fumigator will place the fumigant as well as a smelly, irritating warning agent in specific locations throughout the property. After locking the building and placing the appropriate warning signs, the fumigant will be activated. The fumigant will be allowed to sit in the building for a set amount of time so that it can penetrate to every corner and kill any termites that might be inside the wood. Then the fumigation crew will remove the tent and begin the aeration period. After the structure is sufficiently aired out, the fumigator will conduct air tests to make sure that it is safe for reentry. The whole fumigation process usually takes 3 days and 2 nights. Need to schedule a fumigation? Contact us today! Please give us a call if you have any questions about our fumigation services, or wish to schedule an appointment for fumigation.